"Meet Jen Fellows, your average suburban housewife. Every day she lives out your normal suburban life. She makes breakfast, takes the kids to school, cleans the house, cooks dinner, kisses her husband and children goodnight, and hopes that the drugs she gave them in their dinner keeps them asleep until morning. 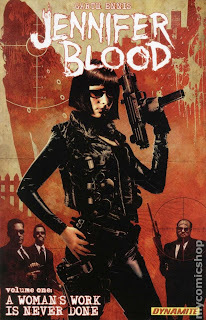 "Meet Jennifer Blood, ruthless vigilante. Every night she stalks the underworld on a personal vendetta against organized crime, determined to obliterate the parasites and scum who run the city's rackets. "But can she keep her dual lives separate? Can she protect her family from the terrible world she now finds herself a part of? And will the budget stretch to new cushion covers for the new couch and six more cases of .45 hollow points?" Thoughts: Honestly, I don't remember when I picked this one up. The cover, art, and storyline really caught my attention. However, I guess it just got lost on my shelves. After her father, a ruthless gangster, is killed by his brothers, Jen is forced to fake her own death and go into hiding. She decides to use her father's money to get trained as an assassin in order to seek revenge for her father's death. However, while doing this, she has to balance being the perfect housewife. The only redeeming quality in this graphic novel is the art. The whole storyline is tired and boring. Jen is the perfect assassin. Even though she has issues with recon, everything still works out for her. All of her jobs go off without a hitch. The people they hire to kill her are little more than jokes. Aside from starting Preacher, I don't have any experience with Garth Ennis. So I cannot compare Jennifer Blood to his other stuff. That being said, from what I've heard about him, this just falls short. It lacks creativity and follow through. 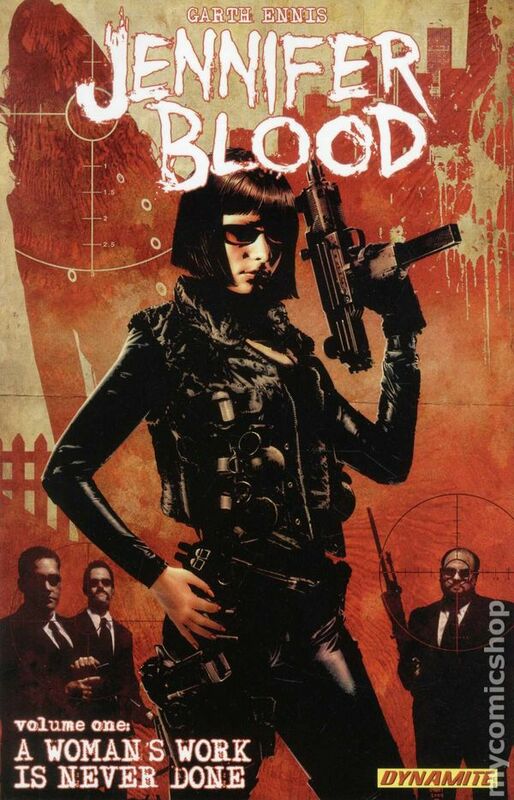 If you're looking for a tired story of the perfect assassin/mother/housewife, this is the graphic novel for you. If you want something with more substance, close calls, and so on, stay away from this one.